A number of large telescopes were used to observe quasar J0439+1634 in the optical and infrared light. The 6.5m MMT Telescope was used to discovery this distant quasar. It and the 10m Keck-I Telescope obtained a sensitive spectrum of the quasar in optical light. 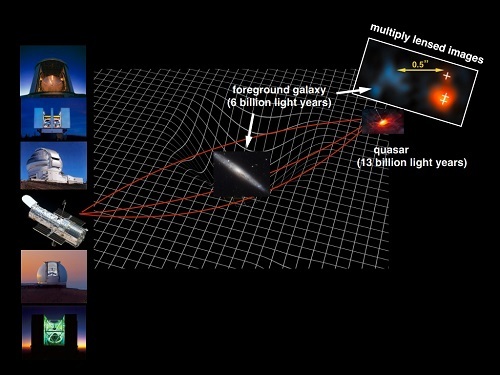 The 8.1m Gemini Telescope obtained an infrared spectrum that accurately determined the quasar distance and the mass of its powerful black hole. The 2x8.4m Large Binocular Telescope captured an adaptive optics corrected image that suggests the quasar is lensed, later confirmed by the sharper Hubble image. The light from quasar J0439+1634, some 12.8 billion light years away, passes close to a faint galaxy that is about six billion light years away. The gravity of this foreground galaxy warps the space around it, according to Einstein’s theory of general relativity. This bends the light like an optical lens, magnifies the quasar image by a factor of fifty, while at the same time split the quasar image into three. Both the foreground galaxy and the multiply imaged quasar are captured by the high resolution image of the Hubble SpaceTelescope. Citation: The Discovery of a Gravitationally Lensed Quasar at z = 6.51.